'A brilliant read. Utterly captivating from the first page to the last… Everyone was so well and clearly written… A real mark of excellent and captivating character writing… I can’t over emphasize how much I enjoyed this book… it’s my read of the year so far and I think it will take some beating… Five of the strongest stars' Goodreads Reviewer, Five Stars. 'WOW, I just loved it. It was gritty, fast-paced… WOW, this book is just brilliant. Patricia Gibney books just get better and better. If I could give this book 10/10 I would.' Goodreads Reviewer, Five Stars. 'This one definitely didn't disappoint!!... Absolutely brilliant read… I honestly can't wait for the next one. Hurry please.' Goodreads Reviewer, Five Stars. 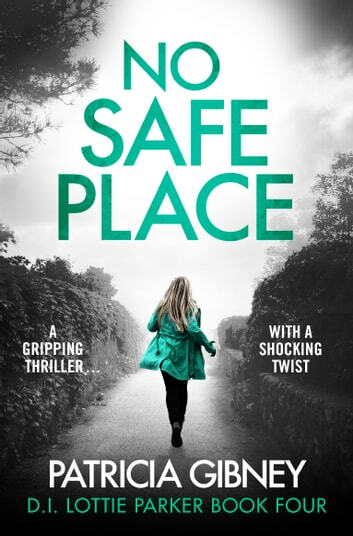 'I thoroughly enjoyed No Safe Place which is a fast-paced procedural with plenty of twists and turns… [Lottie Parker] is a wonderful creation and one of the best characters in crime fiction for it. No Safe Place is a great read which I have no hesitation in recommending.' Goodreads Reviewer, Five Stars. This is the fourth book I have read about Lottie and Boyd. I could not put it down until finished. Patricia Gibney stories are well written and keeps you guessing right to the end who is the guilty person. Yet another fantastic novel in the DI Lottie Parker series. Full of twists and turns, keeps you guessing until the end & leaves you wanting more. This case is becoming personal to Boyd, when his sister Grace makes a new friend, Mollie, on the train to Dublin and this new friend disappears. Grace is not giving up and is trying to find out what happened to Molli. Then Grace disappears too and an old unsolved disappearance may be the only lead to all missing girls. DI Lotti Parker is not a very likable or easy person. Always on the verge to a break down, drinking to much and her children often have to fend for themselves. So, why is it I like these books about her so much+ maybe it’s because Lotti Parker has flaws some a real person. She’s not some superhero, saving the day, raising her kids and always smiling. The only thing I really hope for, is that she will find a way to see how good Boyd is for her and stop fighting him. I highly recommend the DI Lotti Parker series! I chose to read this book and all opinions in this review are my own and completely unbiased. Thanks to NetGalley and Bookouture! Well written with relatable characters. Good story line with a nice twist in the tale at the conclusion.